How do we represent the past to ourselves and to others? Which of our many pasts do we represent, and when, where, and why do we change those representations? How do those representations shape our actions, identities, and understandings? How do individual-level processes interact with collective ones, and vice versa? What does it mean to think about “memory” in these broad ways? In what ways are we ethically and politically obligated to remember, and what are the consequences of meeting, or failing to meet, these obligations? These and other questions, asked from a variety of disciplinary perspectives and with a variety of analytical tools, constitute the broad field of memory studies, which draws on traditional academic disciplines like psychology, sociology, history, political science, anthropology, archeology, philosophy, and literary studies, among others; on related interdisciplinary fields like museum studies, media studies, oral history, heritage studies, archive studies, and film studies; and on professional fields of practice from technology, the arts, and politics. The Memory Studies Association thus welcomes all scholars and practitioners interested in the ways we draw on, shape, and are shaped by the past. Memory studies has grown considerably over the past decade, but does not yet have many clearly designated venues for people from different disciplinary and professional backgrounds to exchange ideas and to learn from each others’ theoretical, methodological and empirical approaches. Moreover, questions surrounding remembering are being investigated around the world, but there is too little interaction (and thus, often a lack of understanding) between various places. We hope to change this by actively identifying and inviting scholars and practitioners who are thus far underrepresented in existing scholarly networks. Finally, the MSA seeks to foster politically and civically engaged scholarship by publicly voicing concerns about political uses of the past. 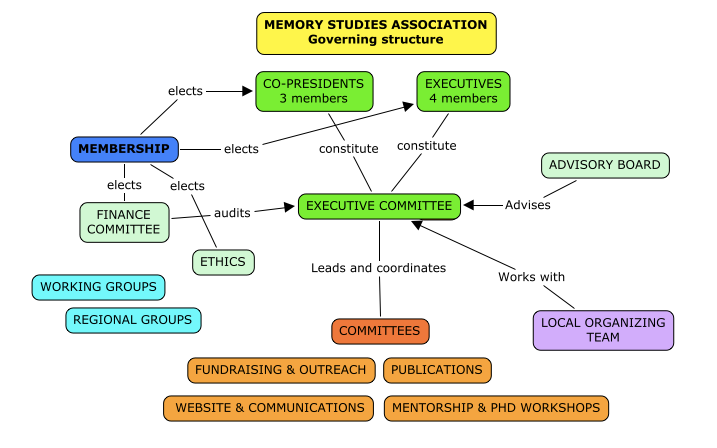 Learn more about the MSA, see the organigram here and read the essay “The Memory Studies Association: Ambitions and an invitation”, co-authored by Aline Sierp, Jenny Wüstenberg and Jeffrey Olick, and published in Memory Studies, here. The Memory Studies Association was launched symbolically at its inaugural conference in Amsterdam (3-5 December 2016), which was attended by around 200 scholars and practitioners from a wide range of disciplines. It was legally registered on June 26, 2017 in the Netherlands. Read its by laws here. Aline Sierp is Assistant Professor (tenured) in European Studies at Maastricht University (NL). She holds a PhD in Comparative European Politics and History from the University of Siena (IT). Her research interests cover collective memory, questions of identity and European integration. Before joining the University of Maastricht, Aline Sierp worked as researcher at the Dachau Concentration Camp Memorial Site (DE). She has published widely on memory and identity issues and is the author of History, Memory and Transeuropean Identity: Unifying Divisions (Routledge, 2014). Jenny Wüstenberg is DAAD Visiting Assistant Professor in Political Science and German & European Studies at York University in Toronto. After receiving her PhD in Government & Politics from the University of Maryland, Jenny worked at the School of International Service at American University, at the Free University of Berlin, and for the Independent Academic Commission at the Federal Ministry of Justice for the Critical Study of the National Socialist Past. She is the author of Civil Society and Memory in Postwar Germany (Cambridge University Press). Jeffrey Olick is William R. Kenan, Jr. Professor of Sociology and History at the University of Virginia, and Sociology Department Chair. He received a B.A. with High Honors from Swarthmore College (1986) and an M.A., M.Phil., and Ph.D. in Sociology from Yale (1993). While he has published on a wide variety of topics, his interests to date have focused particularly on collective memory, critical theory, transitional justice, and postwar Germany. Current projects include on-going work on these topics, as well as editing a six-volume Cultural History of Memory and developing the outlines of “tragic sociology,” an approach with origins in Nietzsche’s writings on suffering and Weber’s sociological approach to theodicy. He works with students on collective memory, sociological theory, symbolic politics, and history and theory of ideas and meanings, among other topics. Jonathan Bach is Associate Professor of Global Studies at The New School in New York. His work looks at social transformation in Germany and China with a focus on questions of memory, material culture, urban change, and space and identity. He is the author of What Remains: Everyday Encounters with the Socialist Past in Germany (Columbia University Press, 2017) and Between Sovereignty and Integration: German Foreign Policy and National Identity after 1989 (St. Martin’s Press, 1999), and co-editor of Learning from Shenzhen: China’s Post-Mao Experiment from Special Zone to Model City (University of Chicago Press, 2017). He previously served as the co-chair of the German Studies Association Interdisciplinary Memory Studies Network. Wulf Kansteiner is professor of history at Aarhus University, Denmark. A cultural and intellectual historian of twentieth-century Europe, Kansteiner has published widely in the fields of media history, memory studies, historical theory, and Holocaust studies. He is the author of In Pursuit of German Memory: History, Television, and Politics after Auschwitz (2006) and coeditor of The Politics of Memory in Postwar Europe (2006), Historical Representation and Historical Truth (2009), Den Holocaust erzählen: Historiographie zwischen wissenschaftlicher Empirie und narrative Kreativität (2013), and Probing the Ethics of Holocaust Culture (2016). He is also co-editor of the journal Memory Studies. Sarah Gensburger is a senior researcher at the French National Center for Scientific Research (CNRS) and a member of the Institute for Social sciences of Politics (Nanterre University). At the crossing of history, sociology and political science, her work looks at the interection between remembrance public policies and social appropriations of the past. She is the author of National Policy, Global Memory. The Commemoration of the Righteous among the Nations from Jerusalem to Paris (Berghahn Books, 2016) and Witnessing the Robbing of the Jews. A Photographic Album, Paris 1940-1944, (Indiana University Press, 2015), and co-editor of Resisting Genocides. The Multiple Forms of Rescue (Columbia University Press, 2011). She has curated several exhibitions and experienced new forms of writing about memory such as blogs and visual sources. Hanna Teichler holds a Phd from the department of Anglophone Literatures and Cultures, Goethe University Frankfurt, and a M.A. degree in English, French and Portuguese philology. She works as a research associate at the department of Anglophone Literatures and Cultures at Goethe University, Frankfurt. Her Phd thesis engages with reconciliation processes in Australia and Canada and their resonance in contemporary transcultural literature and film. It is in preparation for publication. Hanna is member of the advisory board of the Memory Studies Association, Frankfurt Memory Studies Platform and GAPS. — to move beyond the Euro/Anglo centrism that has underwritten the development of the field. We thus aim to bring scholars from different regions to the table. — to draw in practitioners, artists, and policy-makers, making the MSA a forum not only for scholarly debate, but one through which scholars can make connections to more practical realms, and practitioners and producers of memory can be informed about the state of the art in memory scholarship. — to explore the possibilities for, and limits on, genuinely interdisciplinary work and cross-disciplinary exchange, for instance by continuing to work on exploring the boundaries between social/cultural concepts of memory and psychological/neurological ones. — to attract, build bridges to, and offer a home for our existing “sister fields,” such as heritage studies, oral history, transitional justice, archival studies. — to represent the interests of memory studies as a community of professionals including offering professional development activities and career boosting services. — to increase the visibility of memory studies with both state-based and private funders of academic research and community outreach, as well as with publishers. — to offer our expertise on memory political concerns as they arise in public affairs and ethical debates. 1. Officers: Following an initial founding period (ending September 30, 2020), the association will have three equal co-presidents who will be elected by the general meeting to serve a term of two years. Presidents can each be re-elected twice for a maximum consecutive term of six years. The officers govern the association in close consultation with the other members of the executive committee. The co-presidents represent the association in external business, implement the decisions of the general meeting and the executive committee, and determine the intellectual course of the association. The officers also set the agenda and conduct the meetings of the general membership, the advisory board, and the executive committee. 2. Executive Committee: The executive committee is the decision-making body of the association. It consists of the three co-presidents and four additional elected members. The general meeting elects the additional members for terms of two years. They can serve a maximum of six consecutive years. The four additional members of the executive committee are elected in one year and the three co-presidents are elected in the subsequent year. In this way no more than four members of the executive committee can be exchanged in a given election cycle. The executive committee administers the finances of the association and develops the policies and rules of the association, including membership fees and suggestions for bylaw amendments. The executive committee also determines the composition of the advisory board and the number and the composition of the standing committees of the association. 3. Advisory Board: The composition of the board should reflect the interdisciplinary and international profile of the field, providing the executive committee with a wide range of professional perspectives and expertise. Advisory board members are expected to support the work of the association especially with regard to outreach, mentoring of young scholars, and the tasks delegated to the standing committees of the association. The advisory board meets in the context of the association’s yearly conference. 4. Financial Audit Committee: Each year the rules & nominations committee will put forward candidates for a financial committee that the general meeting will elect from among the members, consisting of two persons who may not be on the executive committee. The financial committee must audit the balance sheets and the statement of income and expenditure of the association and must report its findings to the General Meeting. 5. General Membership: membership is open to anybody who supports the goals of the association. All members either pay annual dues or hold the status of sponsored members. Student/Early Career/Low Income Membership: Students, early career academics and practitioners, and self-employed or employed persons with low salaries or limited resources are invited to join the association at a significantly reduced membership rate. Mid Career Membership: the regular membership rate for academics and practitioners who are permanently employed and for self-employed persons with similar resources. Senior Scholar/Practitioner Membership: the regular membership rate for academics and practitioners who are paid at or near the top of their respective pay scale and for self-employed persons with similar resources. Sustaining Membership: all members are encouraged to become sustaining members in their respective membership category thus providing the association with additional resources to fund its programs including sponsored memberships and MSA conference travel grants. Benefactor Membership: a membership category for those who are particularly able and eager to support the development and activities of the association (for instance by purchasing a benefactor membership through their research accounts). Sponsored Membership: people interested in joining the association for whom the reduced Student/Early Career/Low Income Membership rate constitutes a substantial financial burden are encouraged to apply to the executive committee to become sponsored members. Sponsored members do not pay dues but hold all privileges of MSA membership. 5. Standing Committees: Membership in standing committees is determined by the executive committee. All standing committees have at least one member who is also a member of the executive committee. At the moment the association has the following standing committees: Budget, Fundraising & Outreach, Website Development, PhD/Early Career Development, Conferences, Publications, Rules & Nominations. III. Conferences: The association aims at holding at least one conference each year dedicated to the distribution of research, reflections on teaching and public history practices, and career development. The location of the conference should rotate on a global scale and the call for papers and the program of the conference should reflect the interdisciplinary range of the field. The conference is organized by the conference committee in cooperation with the executive committee. IV. General Meeting: The co-presidents call a general meeting at the association’s conference and report to the membership about the development of the association. Moreover, whenever possible, all nominations, bylaw amendments, and significant policy changes are discussed at the meeting. The general meeting is conducted according to Robert’s Rules of Order. V. Elections: Each year, the rules & nominations committee, in cooperation with the executive committee, generates nominations for co-presidents or member(s) of the executive committee. The nominations are presented to the membership on the association’s website approximately four weeks before the annual conference, with the expectation that the candidates are prepared to discuss their candidacy at the annual meeting. The elections are conducted electronically within three months after the annual meeting. All members in good standing may participate in the election. A simple majority of cast ballots suffices to be elected. VI. Amendments: Amendments to the bylaws can be proposed by the executive committee, a majority of the general meeting, or 15% of the association’s membership. All suggested bylaw amendments are put to a vote to the general membership within six months as long as they comply with applicable public law and tax rules. All members in good standing may participate in the election. A simple majority of cast ballots suffices for qualified amendments to be adopted. VII. Dissolution: The decision to dissolve the association requires a two-thirds majority in the executive committee followed by a simple majority of the membership. Remaining assets should be transferred to another association with goals and tax status similar to the MSA’s.